Happy Monday! Did you have a great weekend? Welcome to another edition of my top favorite drugstore nail polishes, this time featuring the color blue. Last time I featured green and I have to say, I love me some green nail polish, but lately I have been in a very serious relationship with blue. Cobalt blue, sky blue, denim blue, Tiffany blue, teal blue – you name it, I pretty much love it right now. As I was going through my 5 drawers of blue polish (yes 5!) I realized many of my favorites wound up being from Milani. That isn’t something I would have ever thought, but it’s true. They have been putting out some really great blue colors lately. Nicole by OPI Be Ama-zing! I have swatched most of these for the blog over the years with the exception of Revlon Wild Card. See that photo of Pacific Blue? Wow it was bad. Thank god for improvement and learning! I really love all of these shades but out of these my top 3 faves are probably Pacific Blue, Blue Zoom and Coastal Surf. It just depends on my mood – sometimes I want a sky blue and sometimes I am craving an intense cobalt. Though some of these may look similar, they are all different enough for a blue lover to own them all! 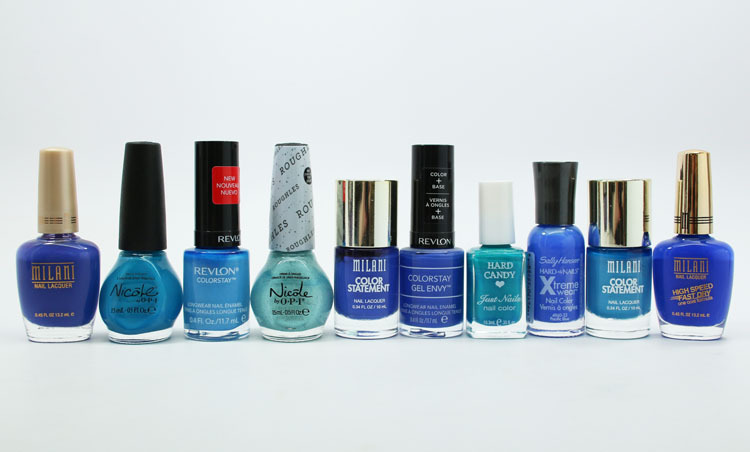 Which drugstore blue nail polishes are your favorites? I love blue nail polish, but can’t seem to pull it off myself. When I have it on my nails, I spend all day looking at my nails thinking that I should take it off .. lol. Monica, me too. I have sooo many beautiful ones, but I don’t know, I feel like it looks bad. It might just be that you aren’t used to it? There are blues for everyone! Just like the perfect red lipstick, sometimes it can be elusive, but don’t give up! I love blue polish and Milani knows blue. Those are seriously beautiful. 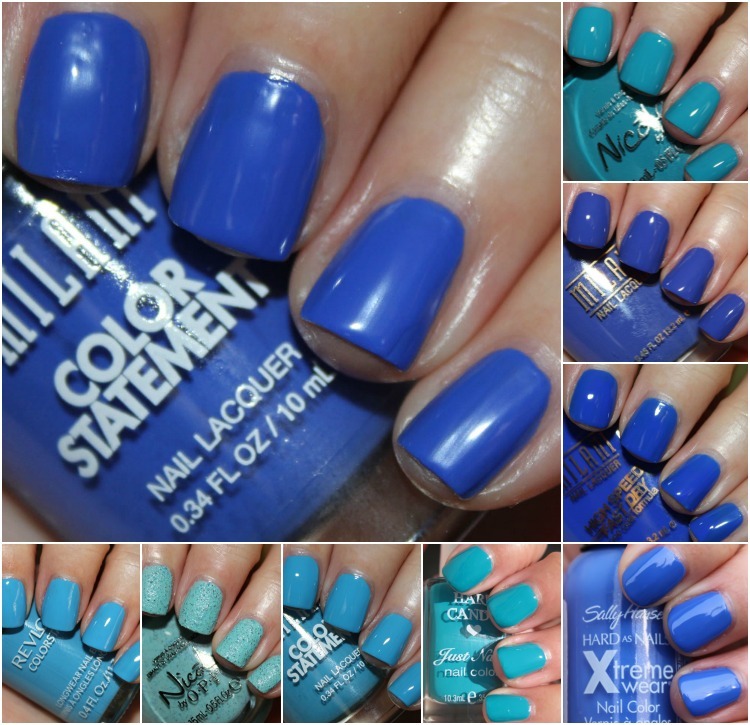 I so agree with Marcia above about Milani’s blue polish. I’ adore blue polish and have quite the collection, but I’m always looking for more! I’ve added some beauties since I put together this post too, haha. MORE, MORE, MORE! I agree with you on the Milani shades, they are very nice compared to most other brands blues. I hope they keep on putting new ones out! That makes for the prettiest collage, so relaxing to look at all those pretty blues! Gorgeous collage, and hooray for the Roughles getting some love! My fave drugstore blues are Sinful Colors Sail La Vie and Matte About Blue. I love blue polishes, but I always feel like they look so weird on me. I’ll stare at the color thinking of how pretty it is and feeling like it looks very odd against my pasty white skin. That NOPI is so unique, love it! Covergirl Out of the Blue and Essence Electriiiiiic are some of my faves, but I love all my blues. It’s the best nail polish color! So much pretty!!!!!! All of these are stunners. Love these posts bc they have so many awesome colors from many brands – it’s really fun! ♡ It feels like my eyes had their candy for the day too, lol. I always love your picks!!! I’m totally buying a blue nail polish next time. So fab!